You are currently browsing the archives for the JPACS HUMANITARIAN OUTREACH category. DPAA’S 1ST YEAR ON THE JOB: A REPORT CARD! Approximately two years ago, efforts to account for our MIA service members and personnel from past wars were in serious trouble, and indirectly the DoD was tagged with the impending failure. I’m not referring to the difficulty of finding thousands of our loved ones’ remains – that’s a given, but rather the challenge of fixing the disarray that existed in the accounting program, causing MIA families and others to lose confidence in the system. Our nation’s largest global, ongoing humanitarian effort was in jeopardy – a program believed to be the only of its kind in the world today was hanging in the balance. In the end Congress gave the DoD an ultimatum: Fix it, or we’ll fix it. Not only did the DoD meet the challenge, but in my opinion, the fix exceeded expectations. Belated congratulations to the Defense POW/MIA Accounting Agency (DPAA) on reaching full operational capability (FOC) as of January 8, 2016 – an important milestone achieved in one year, almost to the day. During the interim period, the DoD continued to account for missing personnel and provide information to MIA families, such as mine. A key element in the process appeared to be on the structural side, as in consolidating several organizations in the accounting community that had been operating quasi independently prior to the emergence of DPAA. The importance of FOC status is a declaration that the reorganization is complete with all DoD legacy accounting organizations now merged into a single, unified defense agency headed by DPAA Director Michael Linnington. “Now is the time to sharpen our focus, increase our efforts, and maximize all aspects of our accounting efforts to better provide answers to the families of our missing.” said Linnington, of an effort that I believe was finally given proper support and respect by the powerbrokers on Capitol Hill. Most successful leaders recognize that no man is an island, and Linnington’s style seems to ascribe to that adage. The accounting program is very demanding and multi-dimensional, so I’m sure his direct-support leadership team –civilian and military – are very capable individuals possessing topnotch skills, cultural fit, likeability and above all, capacity for dedication to the MIA accounting mission. Undoubtedly Fern Sumpter-Winbush was appointed by Linnington to serve as his DPAA Principal Director, because she fits all the necessary criteria and more for this critical support position. As a civilian hire, Winbush brings continuity to the agency. But even more important, she will be Linnington’s point person in the D.C. office, formulating policy, overseeing business development and increasing outreach initiatives, particularly in support of MIA families. Raised in Boston, MA, Winbush was an honor graduate of the University of Massachusetts and a distinguished military graduate of Suffolk University’s ROTC program in Boston, which led to a very accomplished career in the U.S. Army, from which she retired as a full Colonel in 2015. Throughout Winbush’s career, she continued with her education and earned a Master of Science degree in National Resource Strategy from the Industrial College of the Armed Forces, attended Command and Staff College and several other high-level military schools. Winbush’s Army career began in 1983 as an enlisted soldier in the reserves, leading to a commission in 1990. She pinned on her first bar as a 2nd Lt., transitioning into the active duty military, initially serving in Military Intelligence. 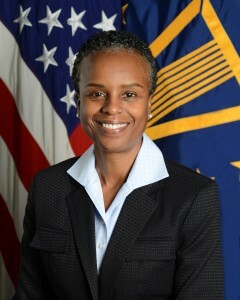 With several deployments over the years to such places as Germany, Saudi Arabia, Iraq, Korea and the Netherlands, Winbush’s last tour was closer to home in command of Joint Base Myer-Henderson Hall — a prestigious assignment and one in which she was undoubtedly proud, serving as the second female commander and the first African-American female commander at the base. She was also the 102nd commander of Ft. Meyer, which has a history dating back to the Civil War and is located adjacent to Arlington National Cemetery. Historical Footnote: One of Winbush’s predecessors was none other than Gen. George S. Patton, who was garrison commander at Fort Myer from 1938-40 before moving on to serve in WWII and become one of our nation’s iconic wartime heroes. In a future blog, I will feature Sergeant Major Michael Swam, who is serving a tour of duty with DPAA as the Senior Enlisted Leader. When you read about Swam, it will be apparent that he really knows the accounting process! U.S. Navy Cmdr. David Boyd, M.D., augmented from the Navy Medicine Support Command in Jacksonville, FL, is teaching a young Laotian mother about healthy nutritional regimens for mother and child, while working along side JPAC recovery teams. Photo by Mass Communications Specialist 3rd Class Nina Hughes, U.S. Navy, Released. PLEASE CLICK THE FOLLOWING LINK TO VIEW MORE IMAGES. The attached photo stream was produced in conjunction with JPAC and offers a brief look at the organization’s humanitarian outreach in Laos. Although I haven’t mentioned a lot about Laos because Jerry was killed in Vietnam where most of our losses occurred, I am learning more about JPACs challenges and successes over the years in Laos, where we still have over 300 MIAs unaccounted-for from the Vietnam War. Thanks to the United States Pacific Command’s Theater Campaign Plan, JPAC has been able to give the people of Laos a helping hand. In July, medical teams treated more than 800 people, providing routine medical care and teaching patients about healthy nutritional regimens. The Laos “Health Engagement” program has been in effect for more than 10 years and facilitates U.S. military physicians from all over the Pacific to gain valuable experience in Tropical Medicine. As many of our Vietnam War vets will remember, Laos is known for its remote and austere locations; therefore, Special Forces medics are paired with military physicians, affording both parties the opportunity to expand their knowledge in diseases rarely encountered in U.S. clinics. JPAC provides five opportunities a year for Physicians and Independent Duty Corpsman/Medical Technicians to augment Health Engagements while working alongside recovery teams. For families with missing loved ones in Laos, it is important to know that humanitarian programs have long been considered the backbone of establishing people-to-people friendships, i.e., getting a foot in the door to countries that needed our help, and we needed theirs. 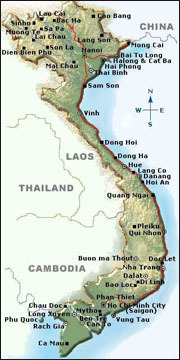 In fact, during the Reagan era in the mid to late 1980s, humanitarian programs in Vietnam were believed to be instrumental in breaking the logjam that prevented one of JPACs early predecessors, the Joint Casualty Recovery Center (JCRC, 1973-92), from creating a solid, ongoing repatriation program for our POWs and MIAs. For the most part, nongovernmental organizations were the only ones allowed to perform humanitarian efforts back then, largely because the U.S. did not have formal relations with Vietnam until the early nineties. Today everything has changed. While it might seem to be business as usual for USPACOM – a major military command – to get behind humanitarian efforts in Laos and/or to be teaming with the Vietnamese in a military-to-military partnership, these are extraordinary and long overdue changes. Our military has returned to Southeast Asia in peace, bringing with them the promise of a new beginning, according to what I heard during the recent government briefing at the POW/MIA League Meeting in D.C. This comes at a time when families with missing loved ones from the Vietnam War know that humanitarian efforts work both ways.